Equatorial Guinea (Spanish: Guinea Ecuatorial), officially the Republic of Equatorial Guinea (Spanish: República de Guinea Ecuatorial, French: République de Guinée équatoriale, Portuguese: República da Guiné Equatorial), is a country located in Middle Africa. With an area of 28,000 square kilometres (11,000 sq mi) Equatorial Guinea is one of the smallest countries in continental Africa. It has two parts, an insular and a mainland region. The insular region consists of the islands of Bioko (formerly Fernando Pó) in the Gulf of Guinea and Annobón, a small volcanic island south of the equator. 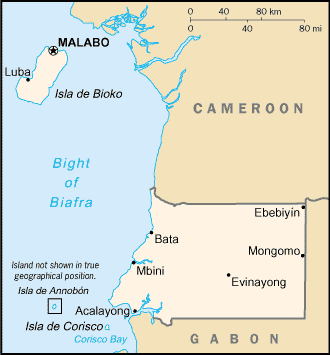 Bioko island is the northernmost part of Equatorial Guinea and is the site of the country's capital, Malabo. The island nation of São Tomé and Príncipe is located between Bioko and Annobón. The mainland region, Río Muni, is bordered by Cameroon on the north and Gabon on the south and east. It also includes several small offshore islands (such as Corisco, Elobey Grande, and Elobey Chico).